Save the date cards are sent 6-12 months before your wedding day. 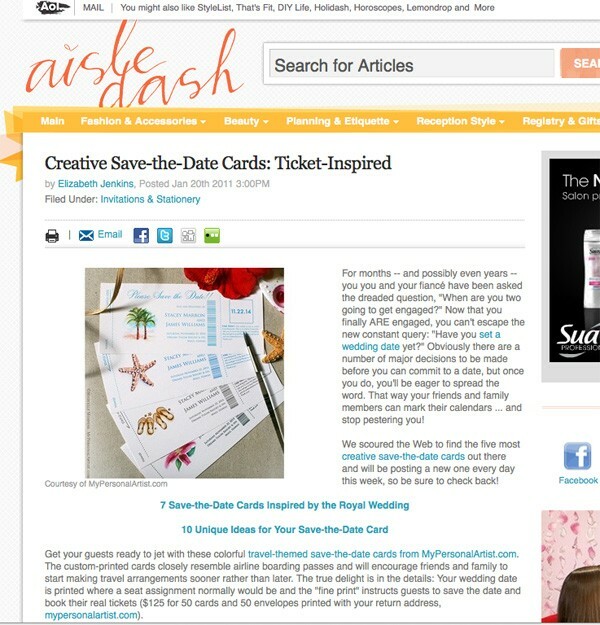 Save the dates help your guests plan vacation holiday time away from work. They also help your guests save money for travel expenses and hotel accommodations if you are having a destination wedding. 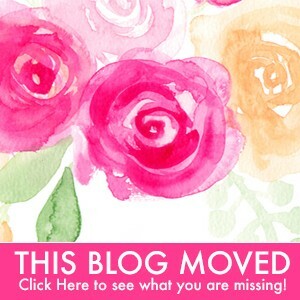 View save the date invitations wording ideas now. Have fun and plan ahead! Remember, less stress is best! Green, Orange, and Black are refreshing and HOT! Perfect for spring and summer weddings. As I mentioned in this post… recently, I was asked by Taste of the Bay magazine to create some wedding color inspiration boards for them. I was delighted to find the perfect wedding photos in the hot 2011 wedding colors from my friends at Linczak Photography. This Green and Orange inspiration board and this tiffany blue, orange, and pink inspiration board will be published in their magazine very soon! 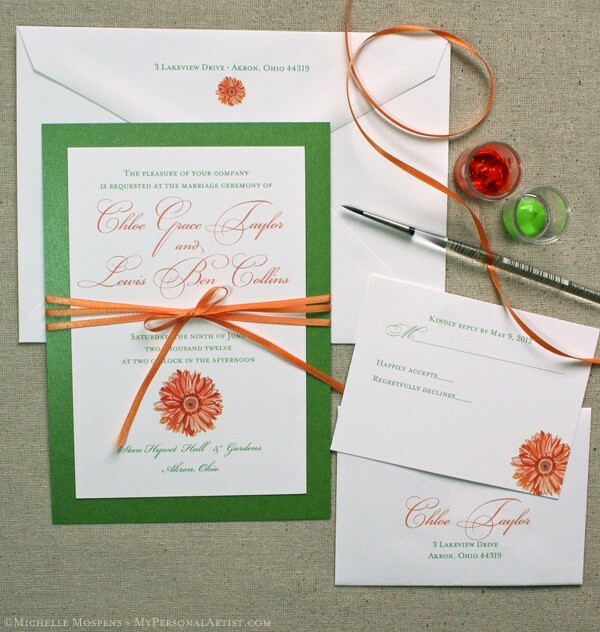 After viewing Linczak’s photos I created the orange and green daisy wedding invitations design shown above, CHLOE. I am seeing more and more fun combinations of wedding colors from our REAL clients. I am working on save the date cards with 2012 brides now also and LOVE helping them decide on their wedding colors and stationery design. 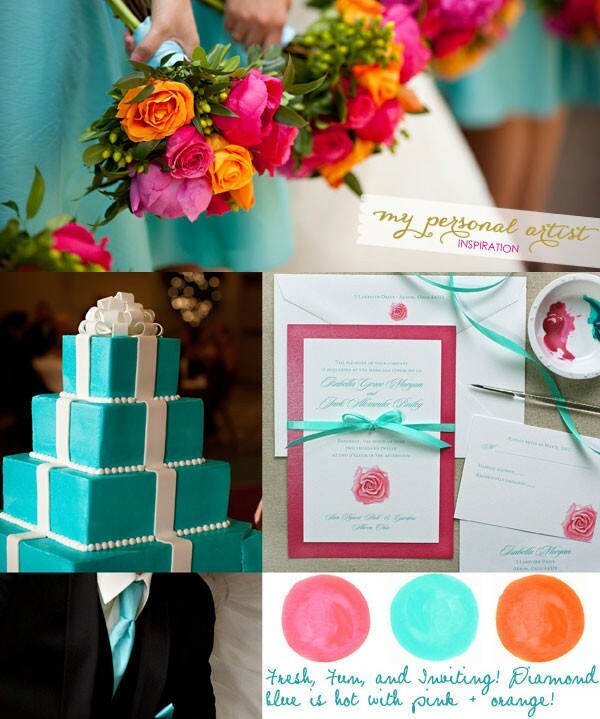 Turquoise / diamond blue is fresh, fun and inviting paired with pink and orange! Hot for spring or summer weddings. Recently, I was asked by “Taste of the Bay” magazine to create some wedding color inspiration boards for them. 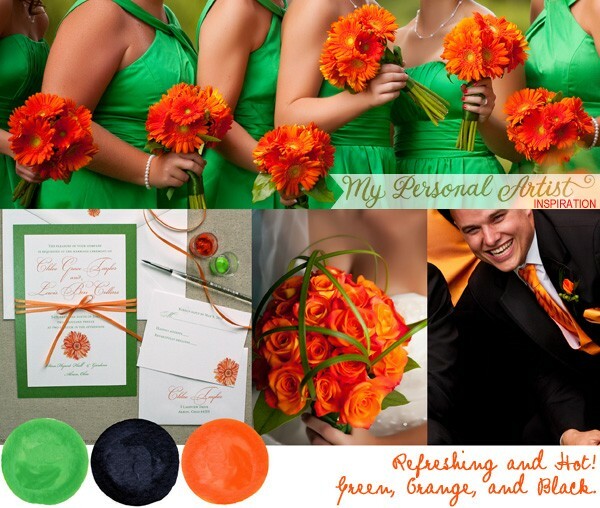 I was delighted to find the perfect wedding photos in the hot 2011 wedding colors from my friends at Linczak Photography. This inspiration board and another (I’ll share very soon!) will be published in their magazine. After viewing Linczak’s photos I created the rose wedding invitations design shown above, ISABELLA. I was thrilled they asked for my help. How much fun! What a refreshing way to invite your guests! Hand-drawn gerbera daisy wedding invitations design adds some artistic flair, and fun, to this unforgettable invitation.. 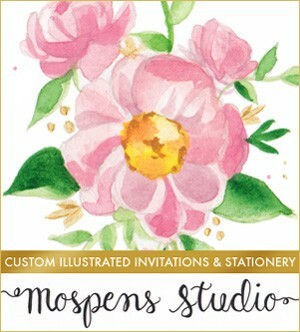 This daisy watercolor design is perfect for your spring, summer, or fall wedding! James and I are working on several new designs for current clients, we can’t wait to share them all!